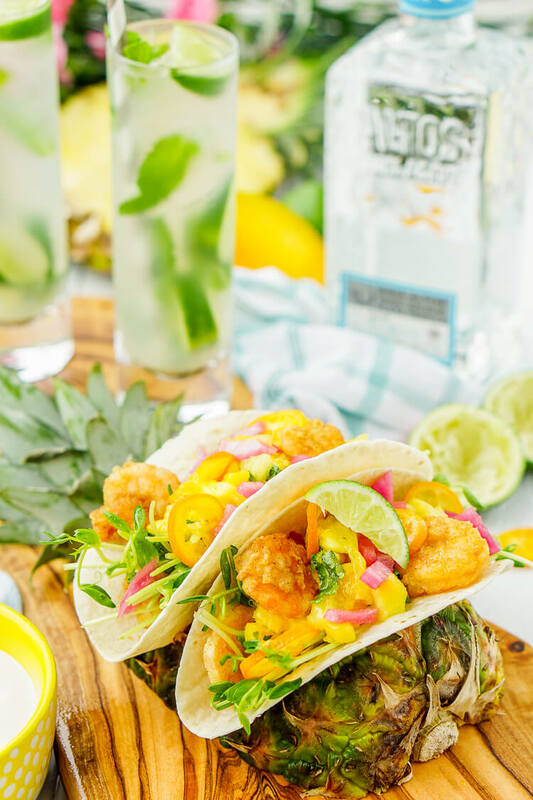 These Tropical Shrimp Tacos are a fruity twist on the classic Mexican dish and loaded up with vibrant flavors and a splash of tequila! A couple of months ago when we were in San Francisco, we went to this restaurant called Loló. Loló is in the Mission District, and it serves up inventive Mexican-inspired small plates. 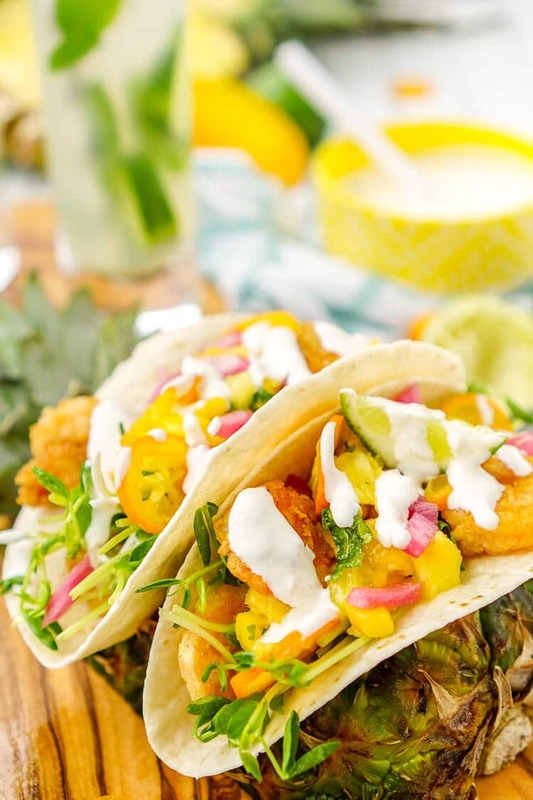 We went because everyone was raving about their Tropical Tacos, well, they were totally worth it, and they inspired me to create a similar dish here at home. I have such a passion for good food and discovering quirky and delicious little restaurants and recreating those delicious bites at home. 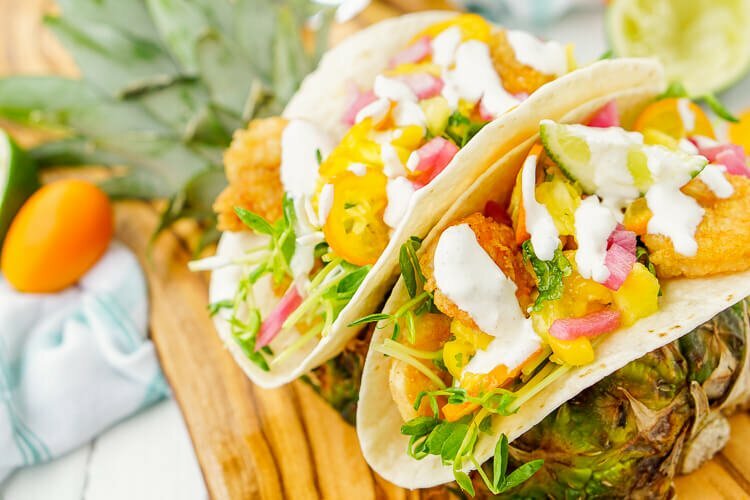 And every bite of these shrimp tacos is a dance party in your mouth, zesty, sweet, and spicy, just like in the restaurant! What more could you want from a taco? I don’t know the actual recipe for their version of these shrimp tacos and can only go by the limited menu description and my own taste buds, but that’s okay because I like making things my own anyway. While they started with a spicy panko breaded fried shrimp, I chose to go with a light flour fry but still kept it spices with a touch of cayenne pepper and paprika. Then it was time for the salsa; I went sweet here with pineapple, mango, and mint. Aside from the salsa, I chose pea shoots as my greens, but watercress would be a fantastic as well! I wanted to finish rounding out my flavor profile with some acid, so I added some thinly sliced kumquats and pickled onions which definitely brought the dish to life! But we can’t have shrimp tacos without a killer sauce. I wanted something that was going to balance everything out and decided to go with a tequila lime sauce with a touch of cumin and cilantro. With a sour cream base, it helps to cool down the bold flavors and adds a creamy layer to the vibrant dish. 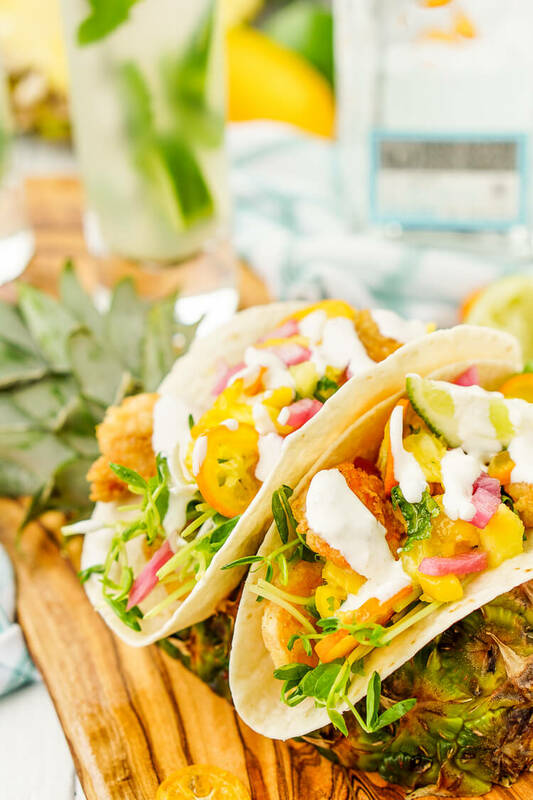 I chose Altos because the region where it grows has a rich volcanic soil that increases sweet flavors to the tequila, which is perfect for the sauce I needed to make. 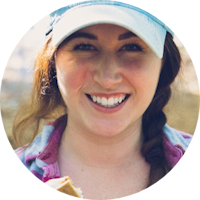 They also use the Tahona Stone method that helps increase the sweetness by crushing the agaves with a 500-year-old method. Altos Tequila is a top shelf tequila at an affordable price, and its smooth finish makes it the perfect addition to recipes of any kind, just see my Tequila Lime Cookie Tarts and Hard Lemonade for proof! 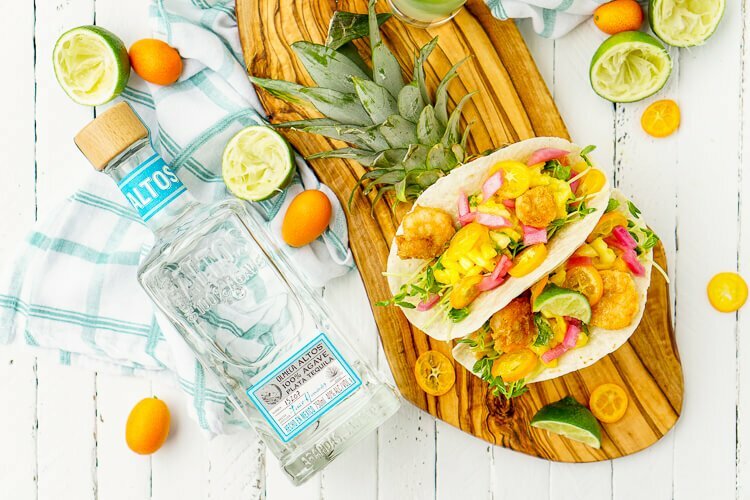 Follow Altos Tequila Twitter and Altos Tequila Instagram and check out the Altos Tequila Field Notes for more tequila inspiration! Oh my goodness, these sound wonderful! 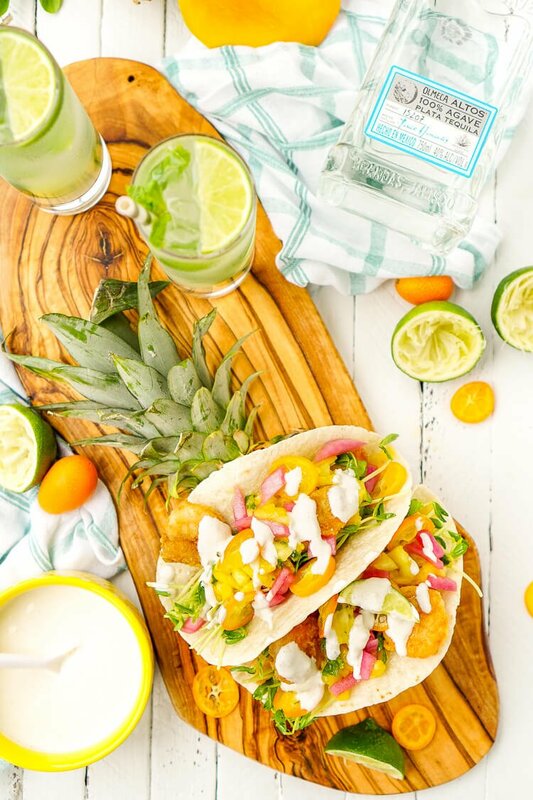 It’s such a fun mix of tropical flavors!